After finding damage to the swimming pool the pool was closed indefinitely. The parks system just didn’t have the funding to repair the structure. The TPWD Foundation along with the Apache Corporation have raised over $1 million and efforts continue. This pool is a unique park in our parks system and it will truly be a triumphant return for this oasis. Be sure and check out the Texas Monthly article on the fundraising efforts. On a recent visit I found myself in the unfortunate predicament of having driven an hour to find the “park full” sign. While this would usually make me happy because it means the park is popular I really had my heart set on a hike today. After a quick discussion with park staff I found myself on a new trail. While you aren’t anywhere near the river or the falls this does mean you aren’t anywhere near the crowds. I left the park, yes that’s right, and took a left from the park entrance. About a half mile down there is a parking lot and a trailhead. The Madrone Trailhead. This 2.5 mile trail provides an escape from the crowds while providing great natural features and birdwatching you may not get in the rest of the park. At the end of this trail you can either walk back up the road to the parking or continue on to another trail. I continued on to the Juniper Ridge Trail (black dotted line above) and took the left turn back towards parking. Really great trail with slightly more challenging paths than the madrone trail, but nothing too challenging for most. I’ve hiked this trail three times now and I’ve only seen one other person. To say this trail is underutilized is fair. You don’t see a lot of evidence of litterers either. But if you do please do the park staff a favor and pick up the trash and pack it out. About two miles into this trail you are faced with more options. You can head back to parking or continue on to more trails. All of the rest of the park is accessible from these trails and I can’t wait to get out and keep exploring. PSA: please remember to check in even though you are parking “outside” the park. The state parks are allocated funding, at least in part, based on the number of annual visitors. Not only are you stealing the daily access fee but you’re hurting the annual funding of the park. Additionally, you should let the park staff know you are hiking on this remote trail. That way if you get hurt or lost they will know where to start looking. Though this park is in my backyard (almost) I don’t visit it as much as I would like. 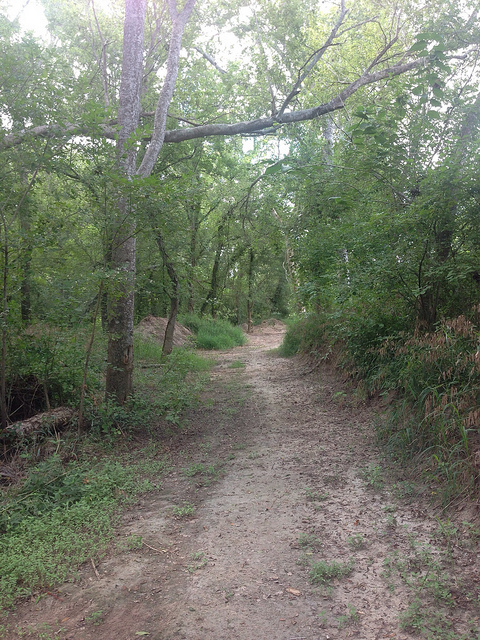 Hoping to change that I visited last weekend and discovered the beauty of the picnic trail and the onion creek hike and bike trail. Don’t worry the trail is wide enough to accommodate our biking friends who seem, at least in my experience, to think the trails are made for them alone. Ok, off my soap box. McKinney Falls State Park is still recovering from the floods a few years ago. The headquarters is still closed for repairs. Much of the Park is still open though. If you know which fork in the trail to take you can find some truly amazing sights in the backyard of the live music capitol of the world. If you’re in the park to do some fishing I encourage you to not fish in the swimming hole and then complain about people swimming in your fishing spot. I witnessed quite the argument during my recent visit and it is completely unnecessary. The best fishing is up stream from the swimming holes anyways. Not going to give away my secrets but put a little effort into moving upstream and you will be rewarded. Here’s the only clue I’ll give. I visited one of the more unique state parks recently. Dug out in part by the CCC about 100 years ago this park offers a very cool (always cool air in the cave) walk through geologic time and in this case more recent history with stories of a “bar” during prohibition and Texas Rangers rescuing a young girl from her kidnappers in a daring nighttime mission. If you haven’t stopped by for the tour I highly recommend. 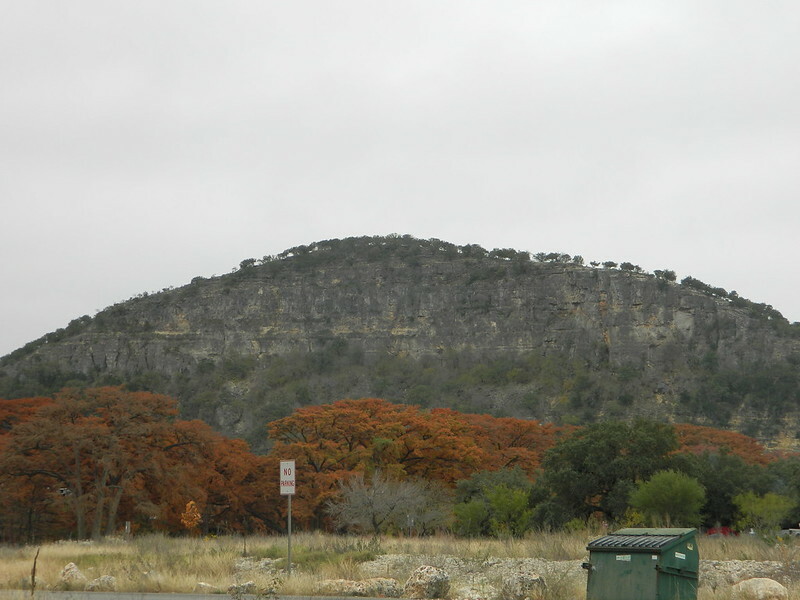 Also, there’s an observation tower in the back of the parking area that offers spectacular views of the hill country and makes for a great finish to your day if you happen to catch the hill country sunset after the last tour. Did I mention a dog guarding the Queen’s throne? Here’s a sneak preview. *i don’t post pictures of caves because it just doesn’t do it justice, the flash affects the bats and others on the tour, and I hope this lack of pictures encourages you to make your own visit. Next to Mission Espiritu Santo is Goliad State Park. 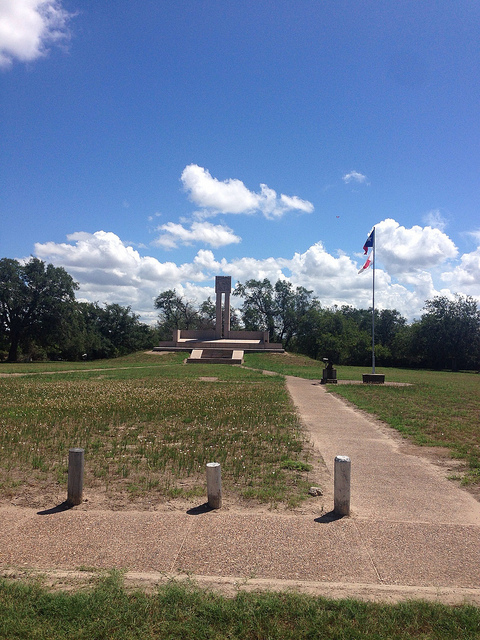 Although small, this park packs a punch when it comes to Texas History. Along with the neighboring mission that I posted about previously there are several other historic sites nearby. Additionally the park has plenty to offer in the form of outdoor activities. 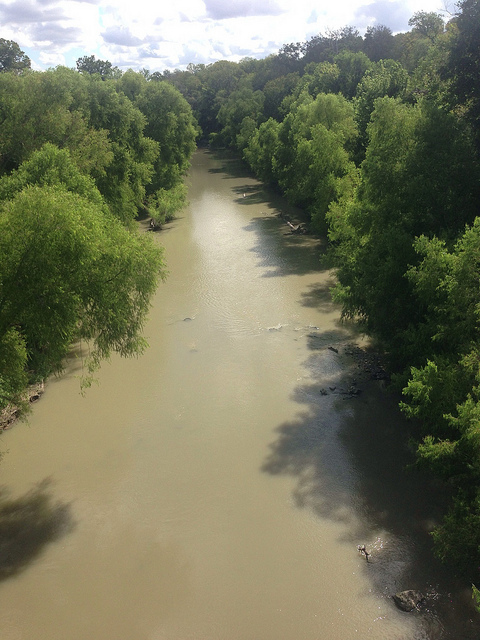 Activities include camping, picnicking, hiking, fishing, swimming is available across from the park, at a junior Olympic swimming pool, operated by the city of Goliad (Swimming Safety Tips), nature study, and historical study. The park offers a floating dock and river access for kayaks and canoes, and is a take-out point for the Goliad Paddling Trail. Park #34 on our quest to visit all the Texas State Parks and Historic Sites was Garner State Park. 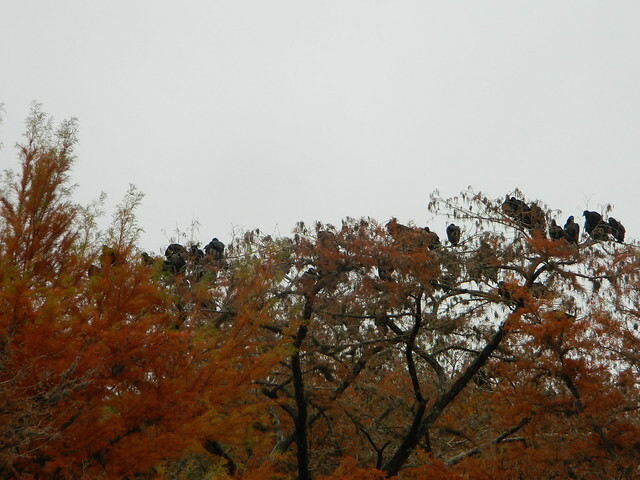 It was very cold and started to rain when we arrived to the park. Even with the conditions we enjoyed the unique features of this park. 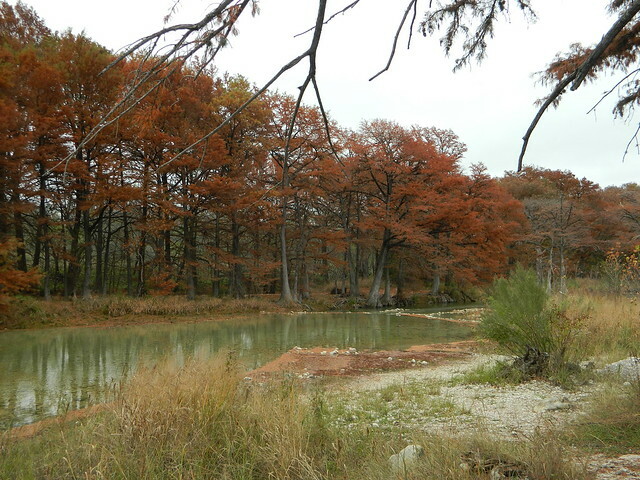 The Frio (pictured above and below) is frequented by many during the summer for tubing activities. You wouldn’t want to do that in November. Besides being really cold, there’s also very little water. Check the visitor’s center in the center of the park for path tags, wildlife viewing suggestions, and other park souvenirs. The main office at the entrance is for entrance fees ONLY and don’t forget to take a number on the way in. There is plenty for the whole family in this park. There is a sand volleyball court, a basketball court, a miniature golf course (seasonal and weather-permitting), camping, hiking, swimming and tubing (seasonal), and much more. You can see why this is one of the more popular parks.